G.E. Silos prepare for another busy season. G.E Silos prepare for another busy season after the demands of last year for their quality grain silos. G.E Silos have a reputation for manufacturing grain silos of superior quality and have recently introduced five new models to their range. 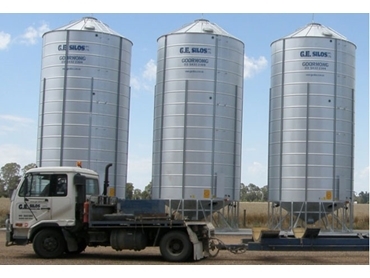 G.E Silos has also completely remodeled the 30T Field Bin and 30T Auger Field bin. The result are grain bins that are more cost effective, user-friendly and safer. “Our newly designed Field Bins now have the safest wheel lifting device on the market,” say Mr Comer.